Exotic animals abound in the post-apocalyptic fantasy Black Moon. 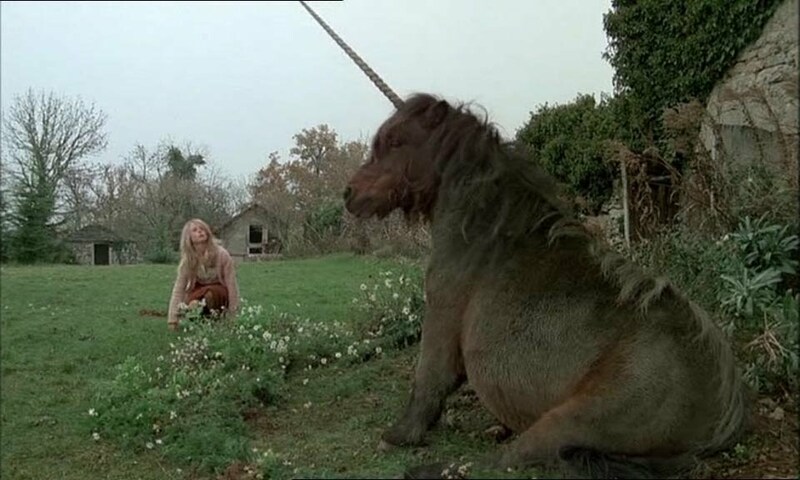 The Criterion Collection released Louis Malle’s (Atlantic City) bizarre and seldom-seen 1975 science-fiction fantasy Black Moon on Blu-ray and DVD on June 28, 2011. Evocatively shot by Ingmar Bergman’s (The Magician) go-to cinematographer Sven Nykvist (Cries and Whispers), the foreign film is reportedly a Freudian tale of adolescent sexuality set in a post-apocalyptic world of shifting identities, talking animals and general weirdness. The movie tells the story of a beautiful young woman (Cathryn Harrison, The Dresser), who, takes refuge in a remote farmhouse after skirting the horrors of an unidentified war being waged in an anonymous countryside. But there she becomes embroiled in the surreal domestic odyssey of a mysterious family. We haven’t seen this cult movie, but the good people of Criterion describe it as “one of Malle’s most experimental films and a cinematic daydream like no other,” and that definitely works for us. As with all of Criterion’s releases, Black Moon features a new high-definition digital restoration. The Blu-ray has an uncompressed monaural soundtrack, and both got a new and improved English subtitle translation.